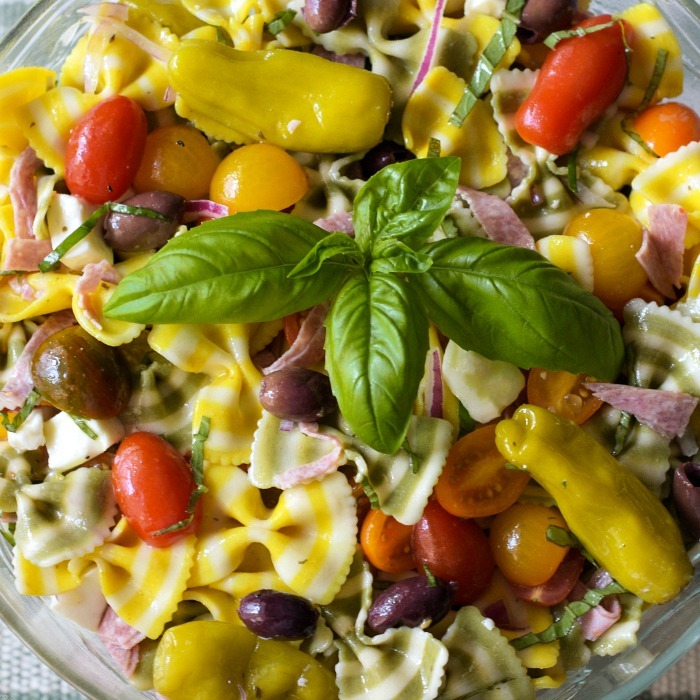 Lemon Basil Farfalle Salad includes everything you desire in an Italian pasta salad. This irresistible pasta dish has striped lemon-yellow and basil-green bow tie pasta. A light vinaigrette dresses the colorful pasta, summer vegetables, and fresh mozzarella cheese. The minute I spotted the striped farfalle pasta at Aldi’s, I knew that those bow ties were going to a party. There is everyday pasta, and then there is pasta for a special occasion. Our family fish fry definitely rated as a special occasion. 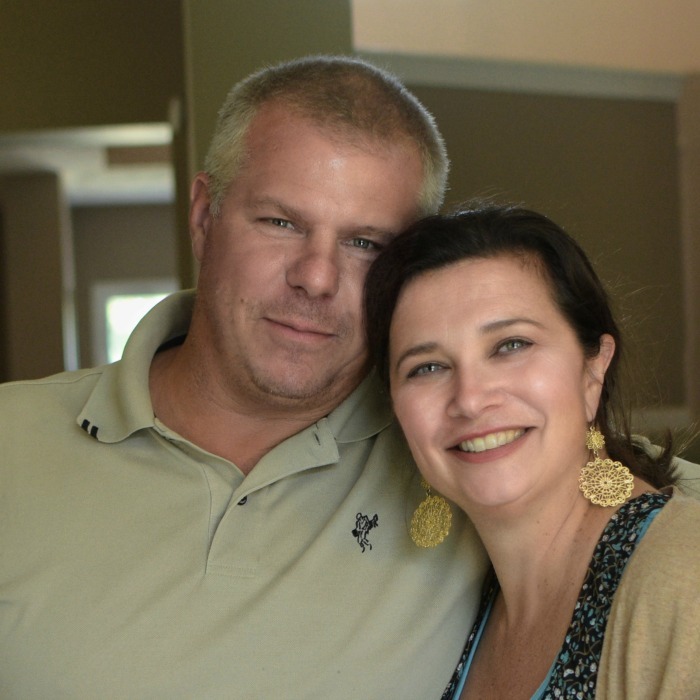 Our son Reid and his wife Lauren hosted our family gathering and decided we should extend the party to not only celebrate our daughter Shelley’s birthday. 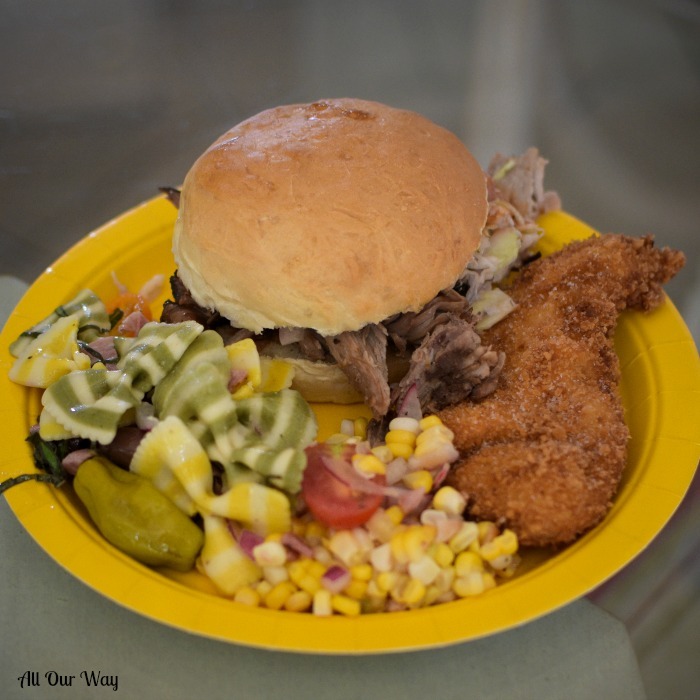 . .
Now, I have to confess; the annual family fish fry didn’t have any fish, it ended up a family pulled pork and fried chicken tenders picnic with some terrific buns. Why? No fish to fry. 😢Last winter fishing in Florida was terrible. Then to make matters worse, in May, Honey had the same luck at Saint Simons Island. So, when we found the bow ties in lemon, yellow, and red stripes, we knew that the pulled pork and chicken would have colorful company to jazz up the plate. Veggie selection for the lemon basil farfalle salad was easy. It had to have an Italian flavor, and it had to be colorful. Grape tomatoes are a must in our pasta salads. We prefer them to any other tomato. They’re sweet, colorful, and they don’t release a lot of juice. Purple onions are mild, and they give the salad color and taste. Peperoncini, which we all love, give the dish a nice briny heat. Salty Kalamata olives are a must for our pasta salad. It’s an unwritten law that cheese has to be in a pasta salad. This time fresh mozzarella cheese was our choice. And last but not least, what could be more Italian than Genoa hard salami? YUM! 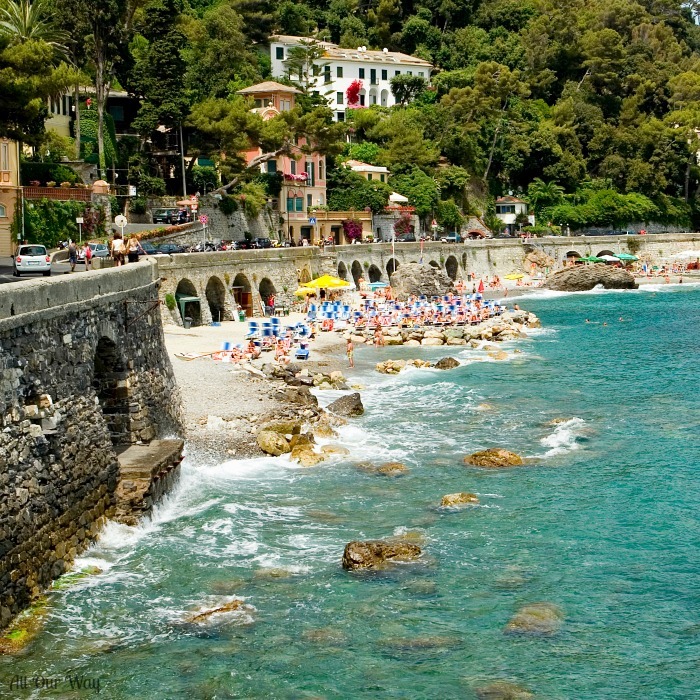 😋 Genoa is part of what is considered the Italian Riviera! Nice, huh?? Make the pasta according to package directions. Make sure that it’s al dente (to the tooth) and add a little olive oil to prevent sticking. Cube the fresh mozzarella cheese. Slice the Genoa salami into short slices. Favorite Italian salad dressing (we used Gerard’s Old Venice Italian) or plain olive oil and white balsamic vinegar. Fresh basil sliced into thin ribbons. That’s it. Put it all together and let it sit in the fridge at least for several hours or overnight. 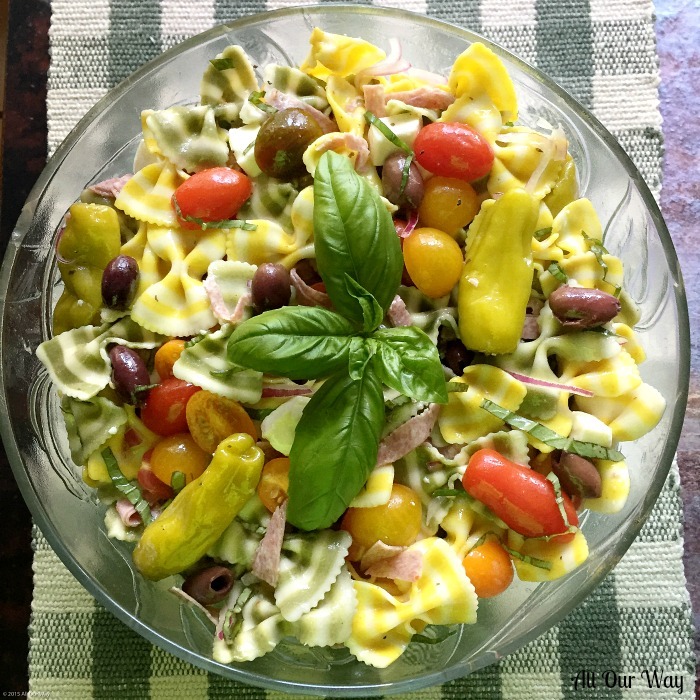 The Lemon Basil Farfalle Salad is a great pasta salad for family gatherings or picnics. It travels well, and it tastes fantastic. This year for the birthday cake I made Ambrosia Coconut Cake. A three layer cake with a creamy pineapple coconut filling that’s to die for. The cake is frosted with Vanilla Buttercream. It’s the type of cake that wipes the word diet or counting calories right out of your mind!! I’ll be posting the recipe very soon. 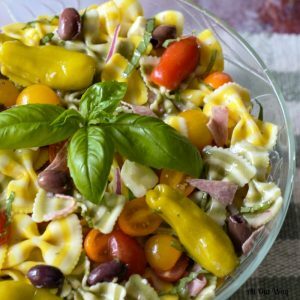 Lemon and Basil Farfalle Salad combines striped bow ties with grape tomatoes, genoa salami, fresh mozzarella, peperoncini, and a light vinaigrette. It is an ideal dish for gatherings because it can be made ahead a stores well. 1 lb. farfalle pasta bow ties or pasta of choice, cooked according to directions. 8 oz. grape tomatoes halved. 1/2 cup sliced Kalamata olives. 1 cup cubed fresh mozzarella cheese. 1 bottle favorite Italian white vinaigrette or make your own. 10 fresh basil leaves sliced into ribbons chiffonade. Made the pasta according to directions. Make sure not to overcook. Drain and put the pasta in a large bowl. Add a bit of the dressing to prevent sticking. The pasta will absorb more liquid as it's in the refrigerator. Layer the ingredients one on top of each other. When all of the ingredients are in the bowl pour more dressing on top and mix well. Grind some pepper over the salad. Sprinkle the basil ribbons over the ingredients. Mix again. It's better to add a little at a time and check the amount before serving. You don't want the salad overloaded with dressing. Wrap the bowl with plastic wrap and place in refrigerator. When ready to serve, check to see if it has enough dressing. Add more to your taste. This is a very forgiving recipe. Add as much or as little as you like. Take your favorite ingredients and include them. Note: Recipes and content from © 2017 All Our Way are copyright-protected. Please do not use content or recipe without prior written permission. If you want to share the information, please link to this post. Grazie. Let’s stay connected. Sign up for our weekly newsletter so we can share what’s happening with us and we’d love to know what’s going on with you. When looking at the photo it looked hard to make but after reading your instructions, I’m going to add this to my cooking schedule with my kids. Who doesn’t love pasta? But adding the olives and tomatoes, it will help my kids see the different flavors of ingredients make the pasta not the main component. We will be trying this out this week! Hello, Danyelle! I’m sure you and your kids will enjoy making the pasta. All of my kids love to cook – boys and girl. Have a great weekend. I have never seen pasta like this! How fun would this be for a party! Thanks for sharing. The salad looks amazing. 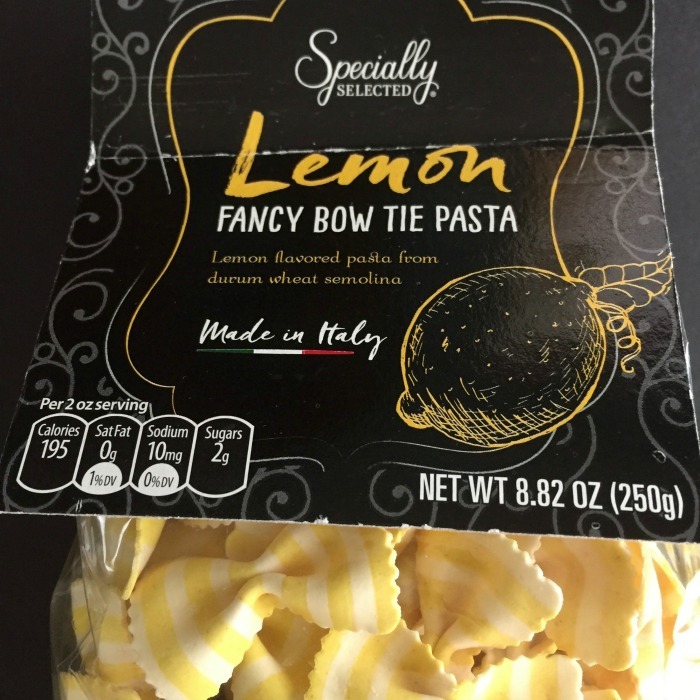 I have never seen lemon bow tie pasta before. I will have to keep my eye out for it. Have you ever had Lemon Basil? If you ever plant a herb garden you have to grow some lemon basil. It is amazing. One of my favorite basils. Sounds like a GREAT pasta salad. Perfect as a side…to all the BBQ’s this summer. Great as a stand alone for a meal. I am so looking forward to the warm sunny weather. 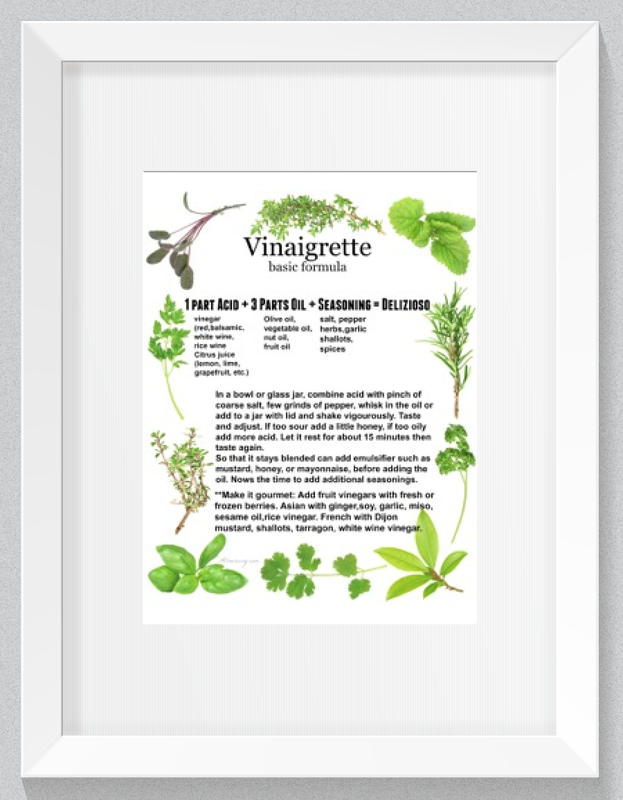 I am going to attempt to have a herb garden. Basil will be one of the things I will be growing for sure. A Bowl full of goodness and health. Cant wait to grab this amazing Bowl of Salad. Tempting and colorful too. This pasta is definitely a party pasta if I ever saw one 🙂 And the salad looks so bright and vibrant! What a perfect way to welcome the warmer weather. PS: It was really nice that you shared pictures of your family. Hope everyone is doing well! What a good looking family you have Marisa, and of course your food always looks so appealing. Hi, Marie! Thank you for your sweet comment. Your recipes are always so inspiring.!! We’re both channeling the lemon these days! I love how pretty this pasta is – dresses up any dish! I love seeing the photos of your beautiful family! Hi Marisa. I am visiting from the Blogging Grandmother Series and I am drooling just looking at all your food pictures! When we eat out, my favorite place to go is Italian. It is a pleasure to meet you and hope to see you around. This salad looks divine and striped pasta–what fun! I’ve never seen anything like it. I found your blog through your Grammy’s Grid interview. So glad I did! I must confess I’m not a fan of pasta salads, but yours, with those adorable and colorful bow ties, seems irresistible. I loved seeing your beautiful children too – and God bless your son in his military duty. Thank you, Linda! We are proud of our children and we are counting the hours until Jason is back home. Un abbraccio forte! The Riviera is gorgeous! I love the striped farfalle…what a delicious salad, Marisa! Thank you, Catherine. It’s always great to have fun looking food that tastes good too. I’m dreaming of escaping there — what a view. Well, who needs fish for a fish fry, anyway? As long as you’ve got side dishes like this, I’m pretty sure nobody noticed the missing fish! You’re right, Noel. Nobody complained about no fish. That’s okay, this fall Hubby can try again for the fish. We do fish fries all the time! We are lucky that we live in Florida near the gulf coast so we have fresh fish available year round. However, sometimes you go out and come back with nothing. Anyways. This pasta salad sounds so good, and it does sound like y’all ended up eating good anyway! Oh I don’t usually make lemon pasta.. but it sounds so refreshing .I love the flavors you have going here. Sounds so delish. My kids love the bow tie pasta. ! Thank you, Veronika! It would make a great lunch. Hi, Adriana! If you have an Aldi’s down your way, check them out. That’s where I got the imported pasta. I love pasta salads. It’s always nice to find new recipes for it! This lemon basil farfalle salad is definitely on my to-try list. Hi, Pam! We love it too. So good and I thought the striped pasta was festive. Haha – love your law about cheese and pasta salad! And I agree with you! The flavours are scrumptious – olives, mozzarella – Delicious! un delizioso piatto di pasta è sempre ben accetto e se condito così ancor di più! (ho scritto in italiano questa volta), un caro abbraccio ! Ciao, Chiara! Grazie mille. Mi piace tantissimo quando scrivi in italiano. Può leggere meglio che può scrivere. Un abbraccio forte! Don’t you love when you find something totally out of the norm, like the lemon pasta? The salad sounds so fresh and tasty! Another yummy recipe to try for my family……..Enjoyed pictures of the kids😊 Tell everyone we said hi and send our love. 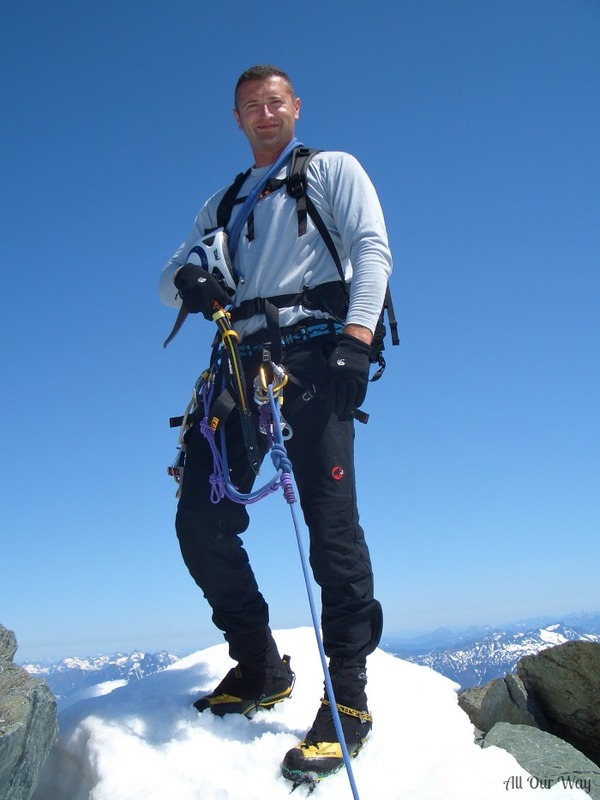 JASON is in our prayers for a quick return home. Hi, Susie!! I certainly was surprised Aldi had such a great imported pasta — it’s just the type we like to buy. I’ll be sure and give your love to all the kids. We can’t wait until Jason is back!!! Love and hugs to you and your clan. It sounds as though we both have Italia in mind this Summer. The salad looks absolute delish! I am visiting you from Sundays at Home with Jennifer Carroll. Ciao!! Yes, indeed! Italia is always on my mind. Thank you for visiting and commenting! Jennifer Carroll is terrific, isn’t she?! What a delicious pasta salad with so many wonderful ingredients. It just says summer when you look at it. Thank you, Jovina! It really was a great find at Aldi. I couldn’t believe it. When we went back for more it was all gone! I would have bought more and saved. Hope you’re having a good weekend.